Many modern musical instruments are cumbersome or have a lot of parts. Some need a stand or a stool. But the cajon is a drum, a stand and a seat all in one convenient box. 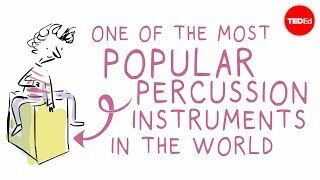 And this simplicity may be key to its journey across the continents and cultures to become one of the most popular percussion instruments in the world today. The cajon‘s story begins in West Africa, whose indigenousness people had rich musical traditions centered on drumming and dancing. When many of them were captured and brought to the Americas as slaves, they brought their culture with them, but without their native instruments, they had to improvise. African slaves in coastal Peru didn‘t have the materials or the opportunity to craft one of their traditional drums such as a djembe or a djun djun. But what they did have were plenty of shipping crates. Not only were these readily accessible, but their inconspicuous appearance may have helped get around laws prohibiting slaves from playing music. Early peruvian cajons consisted of a simple box. with five thick wooden sides. The sixth side, made of a thinner sheet of wood, would be used as the striking surface, or more commonly known as the tapa. A sound hole was also cut into the back to allow the sound to escape. As an Afro-Peruvian culture developed, and new forms of music and dance, such as Zamacueca, Fastejo and Landó were born, the cajon became a dedicated musical instrument in its own right. Early modifications involved simply bending the planks of the box to tweak the sound, and when the abilition of slavery introduced the cajon to a broader population, more improvisation and experimentation soon followed. Perhaps the person most responsible for introducing the cajon to the European audiences was Spanish Flamenco guitarist Paco de Lucía. When touring in Peru in 1977, he and his percussionist Rubem Dantas discovered the Cajon and brought it back to Spain, recognizing its potential for use in Flamenco music. By streching guitar strings along the inside of tapa, the flamenco musicans were able to create a buzz-like snare sound. Combined with the regular base tone, this gave the cajon a sound close to a basic drum set. The cajon quickly caught on, not only becoming standart in Flamenco, but being used in genres like folk, jazz blues and rock. Today many specialized cajons are manufactured, some with adjustable strings, some with multiple playing surfaces, and some with a snare mechanism. But the basic concept remains the same, and the story of the cajon shows that the simplest things can have the most amazing potential when you think outside and inside the box.